Unemployment figures, by age - distinguish youth and adult unemployment - have been preoccupying many analysts in recent weeks. Loads of media attention has been paid - internationally, if not in Ireland - to the plight of youth unemployment. 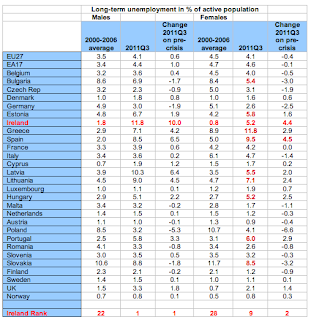 In the next several posts, I will take a closer look at the data for EU27, including Ireland. 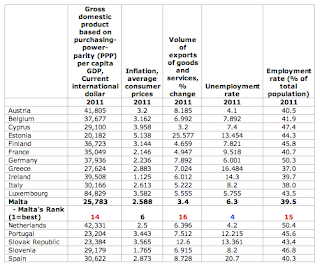 All of the data comes courtesy of the Eurostat and covers the latest available period Q3 2011. First, let's take a look at long term unemployment (defined as unemployment spell of 12 months or more) and very long-term unemployment (defined as 24 months or more). As you can see, we are not exactly a good performer. 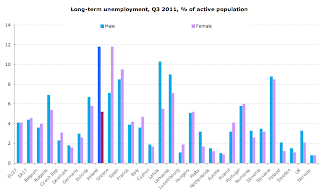 Prior to the crisis, Irish long-term unemployment averaged just 1.4% of the active age population - 23rd lowest in the group of EU27 plus Norway. In Q3 2011 our long-term unemployment stood at 8.8% - the third highest in the sample of 28 states. Over the period covered we have experienced an increase in long-term unemployment of 7.4 percentage points - the steepest rise in the EU27+Norway. 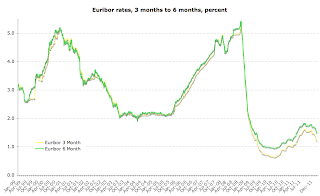 Matters are even worse when it comes to very long-term unemployment, where our rate has moved from 0.7% average for Q3 readings pre-crisis to 5.4% in Q3 2011 - an increase of 4.7 percentage points. 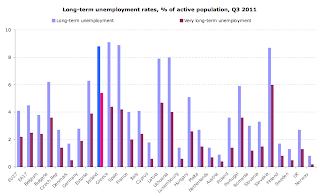 Only Slovakia (6.0%) is worse performer than Ireland in terms of overall very long-term unemployment rate and we are the absolute worst in the EU27 + Norway group in terms of increase in very long-term unemployment. Ireland used to rank 22 in the EU 27+Norway in the size of its long-term unemployment pool amongst the males prior to the crisis. 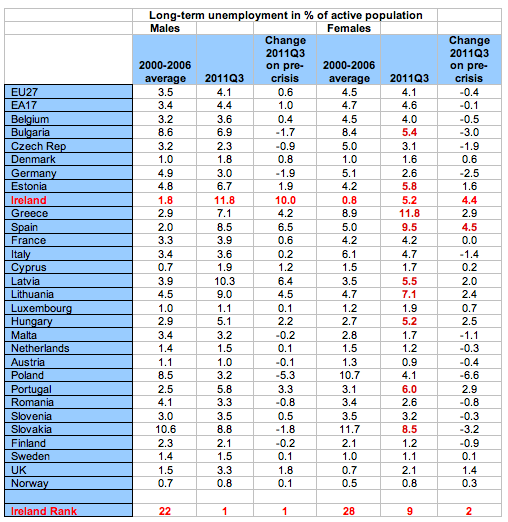 By Q3 2011 we had the highest rate of male long-term unemployment. We fared much better in terms of long-term female unemployment, moving from the lowest unemployment in the sample of countries prior to the crisis to 9th highest position. However, in both male and female long-term unemployment, Ireland experienced the largest and second largest, respectively, increases during the crisis. 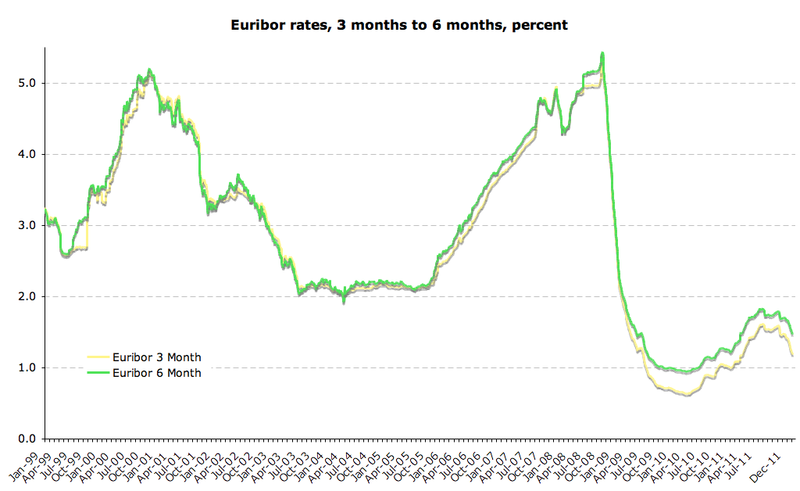 Things are even worse for Irish very long-term unemployed figures. 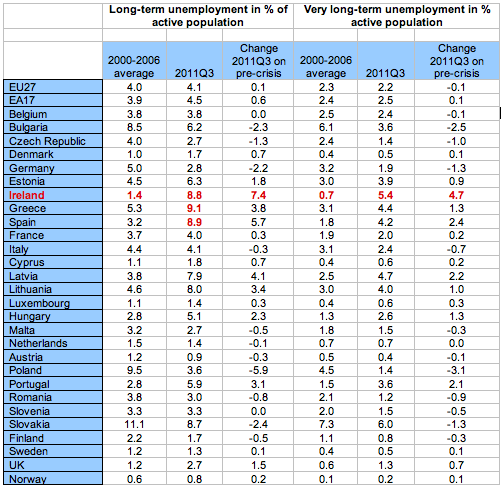 Prior to the crisis, very long term unemployment amongst Irish males averaged 1.0% (22nd highest in the EU27+Norway). 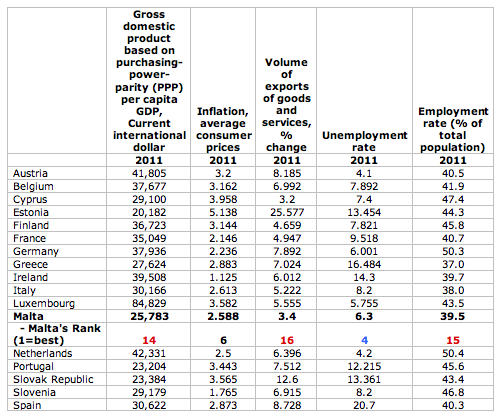 In Q3 2011 that number rose to 7.5% (the highest in the EU27+Norway). This increase was the largest in the sample of countries over the period. Very long-term unemployment amongst the females in Ireland averaged just 0.4% in pre-crisis period - third lowest in the EU27+Norway sample. 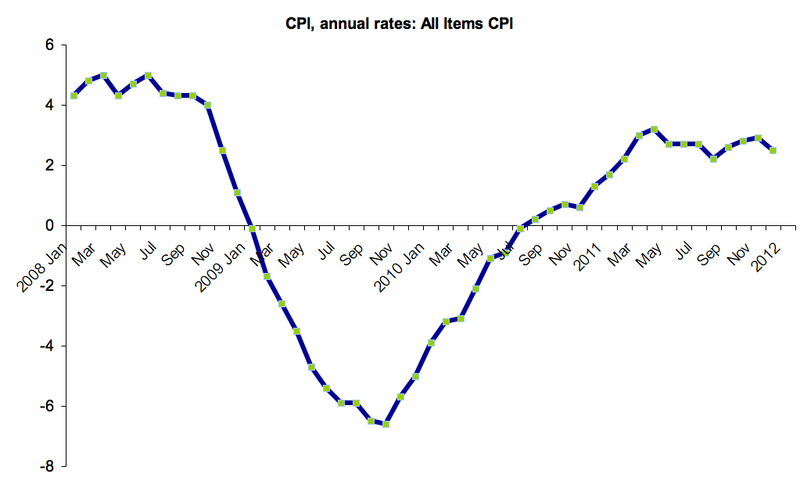 In Q3 2011 this rose to 2.4% - 10th highest reading in the sample. Ireland's rate of increase in female very long-term unemployment was the fastest in the EU27 + Norway group of countries. In the next post we will take a look at the unemployment figures by age. 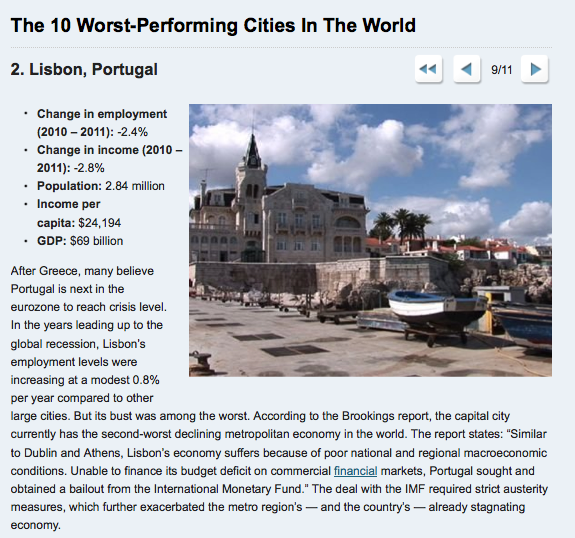 There are many 'expert' voices in the media saying Greece should exit the Euro zone in order to return to growth. This, as I commented earlier today, is a gross oversimplification of the reality. 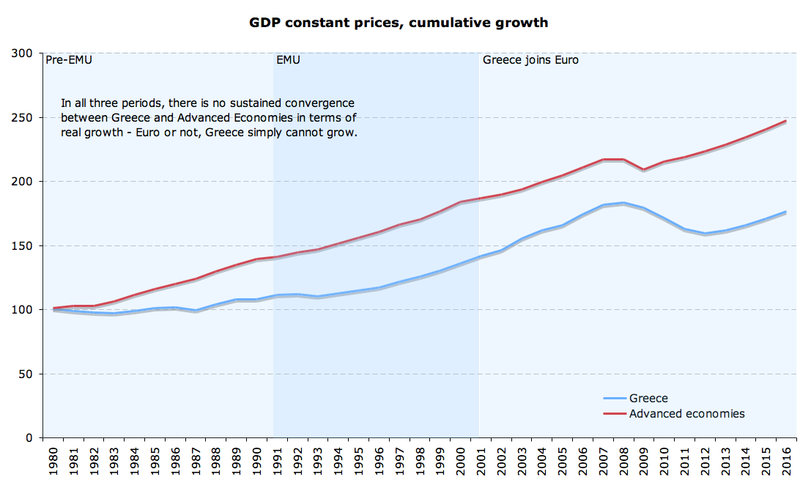 There is simply no evidence whatsoever that Greece can grow on its own any faster or more sustainably than it did within the Euro. 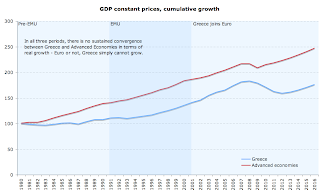 In fact, the evidence presented below shows that the only period during the last 30 years in which Greece was able to somewhat marginally close the gap in growth between itself and the Advanced Economies group is the period immediately following its accession to the Euro. 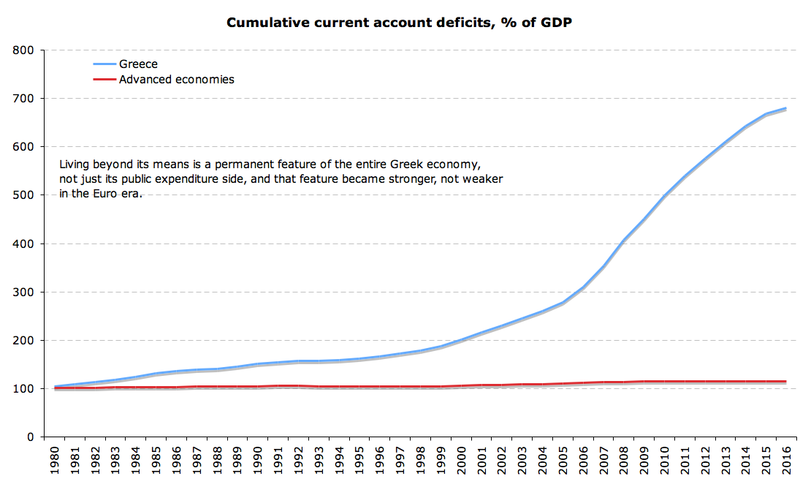 Greece has no fundamentals for growth & its debt overhang will remain, unless it defaults hard. 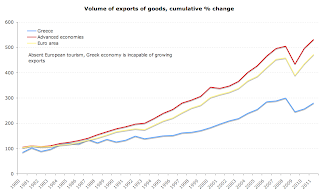 Even with a default, removing debt overhang is not going to deliver growth to Greece beyond simple mechanical post-depression bounce, as Greece lacks all fundamentals for growth - institutional, cultural and historical. 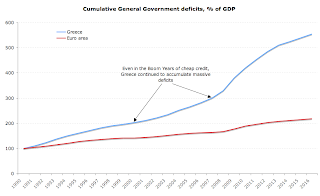 However, with a hard default option, post-Euro, Greece will not be able to borrow & absent Government spending Greece has no capacity to grow. 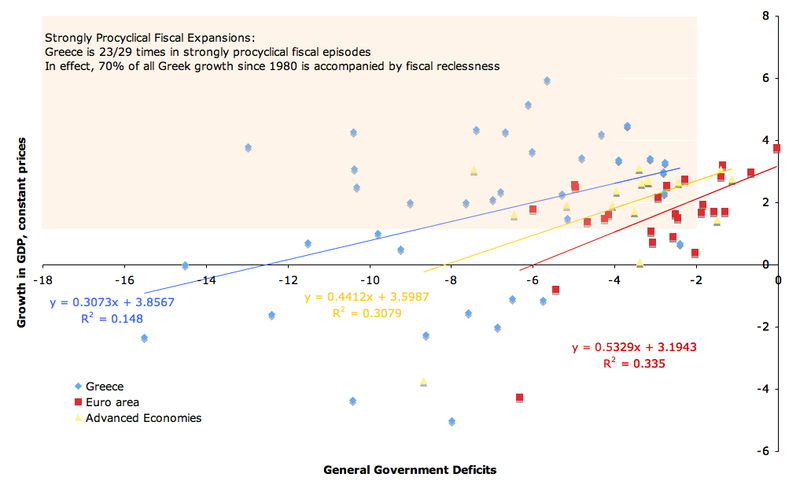 This is clearly shown in the charts below which highlight that in 23 out of the last 29 years, Greece has managed to achieve growth only with accompanying fiscal imbalances. 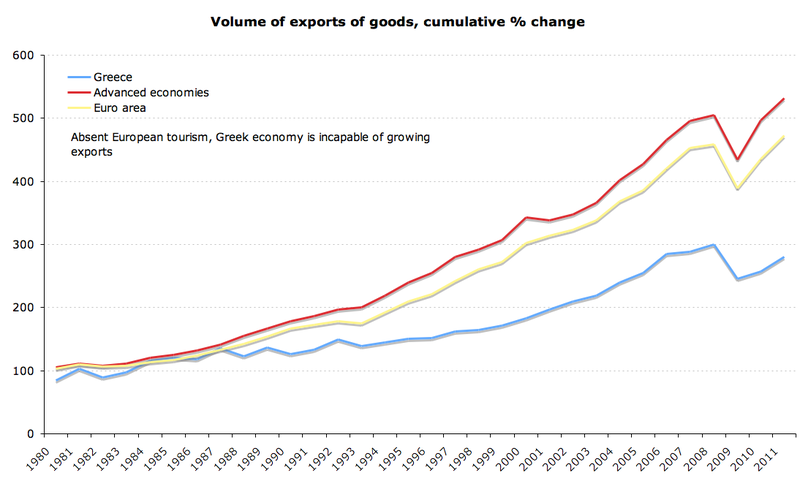 In summary, Greece never once had any fundamentals to grow on its own without massive subsidies either via loose monetary policy or overinflated expectations relating to the country accession to the European common structures. 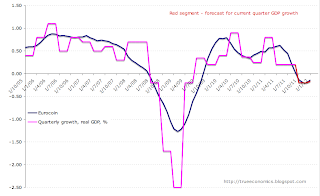 Greece is not about to get real growth-driving fundamentals within or outside the euro area. In short, all those talking about 'Greece must exit euro zone to achieve growth' are nothing more than fake doctors treating a patient who himself is faking a disease. 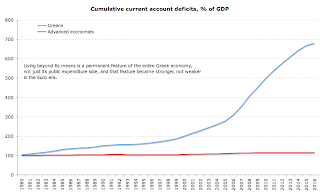 Greece's problem is not the Euro. 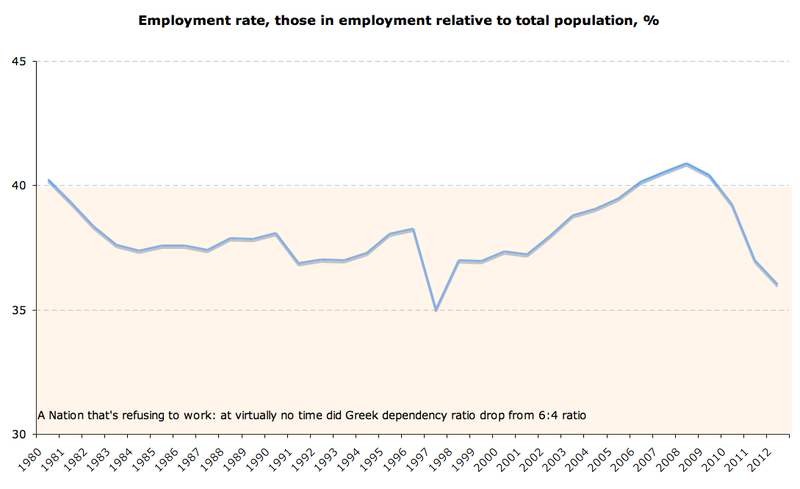 It's problem is Greece itself. Here are the charts proving the point. 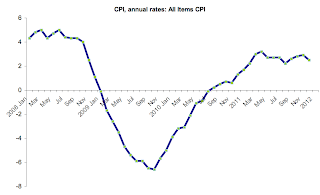 Malta is poor, has moderate inflation, which is of course consistent with low growth. 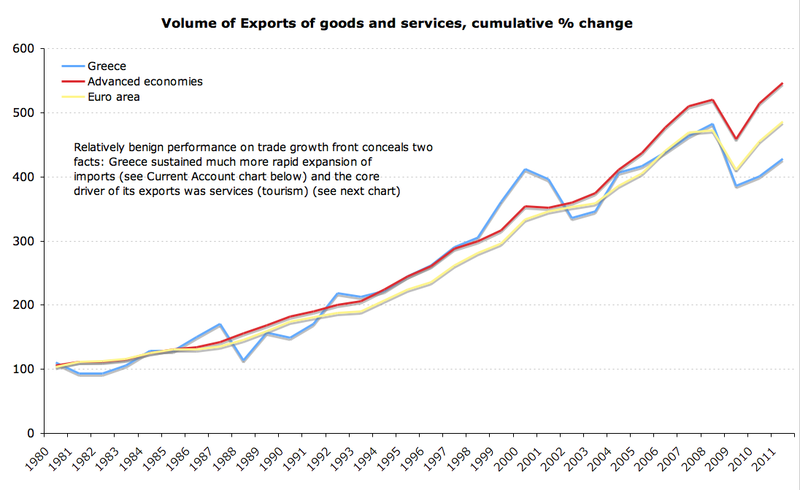 Malta’s exports of goods and services are growing very slowly – if it is such a great trading location, can someone explain this? Malta performs well in unemployment terms, but this conceals the fact that Malta’s population is either too old or too young or too long unemployed to actually count as being in the workforce. 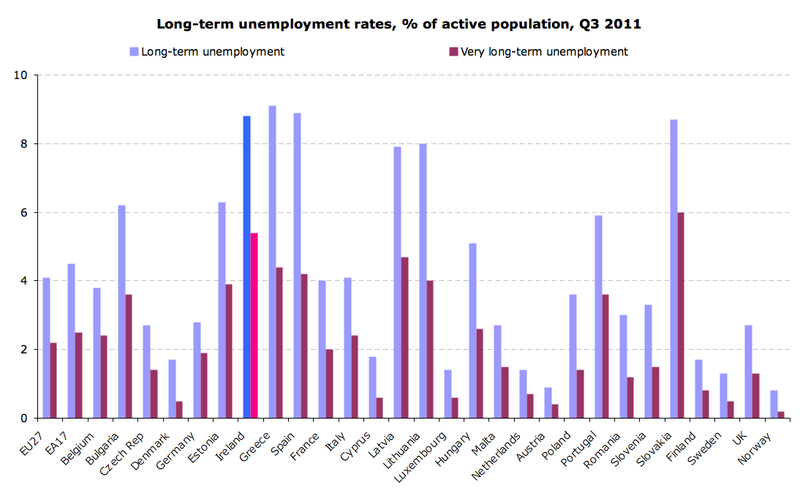 Hence, Malta is second worst performer in the euro area in terms of actual employment rates. 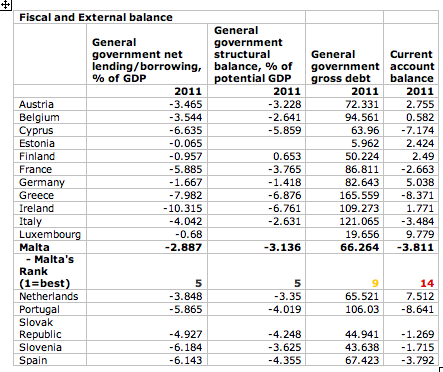 Malta’s public finances are in line with majority of other Accession States, so it is doing decently well (though not spectacularly) in terms of Government deficit and structural balance. It is not exactly a stellar performer when it comes to Government debt, but it is extremely poor performer when it comes to external balance – current account. Which, of course, is the exact opposite of the evidence required to support the premise that Malta is a success in terms of attracting foreign investment, or being a great destination to trade from. You can tell, I hate spin! 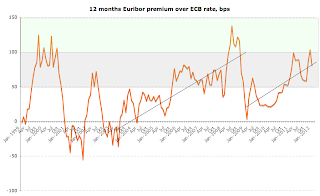 The latest leading indicator for euro area growth -Eurocoin - for January continues to signal recessionary dynamics, albeit at moderating rates of decline. 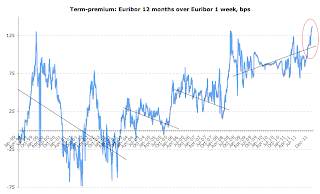 Eurocoin is now in the negative territory for four consecutive months. 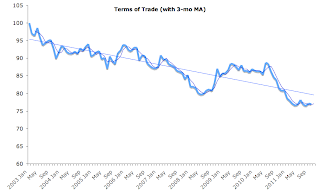 3mo MA is at -0.18, 6mo MA at -0.07, crossing into negative for the first time since the last recession. 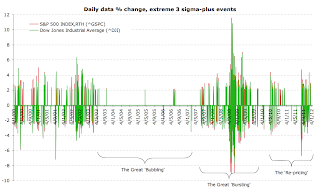 In January 2011 the indicator stood at +0.48. 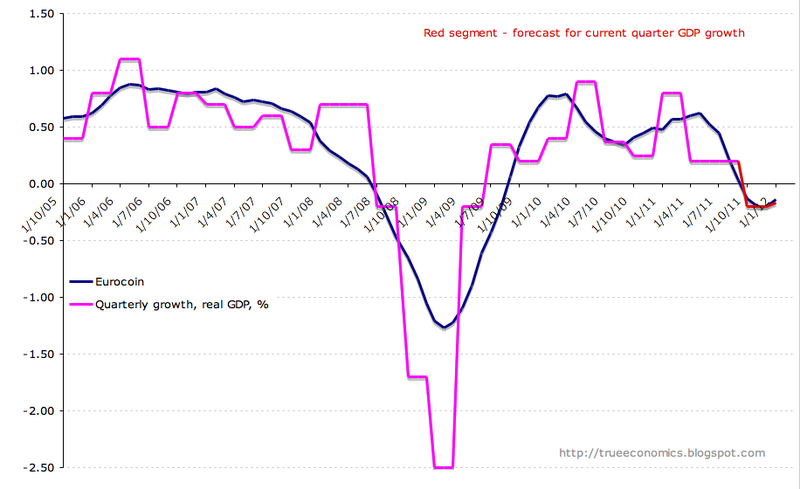 Quarterly rate of growth is now at -0.17 implying annualized contraction of -0.56%. 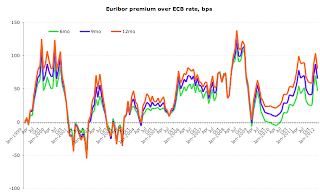 There is now, due to persistent negative reading, more consistency in eurocoin and ECB repo rate, but inflation-growth remain unbalanced when it comes to applying Taylor rule to ECB rate policy. All in, the rates decision based on the leading indicator performance should be to stay put and await more significant moderation on inflation side. 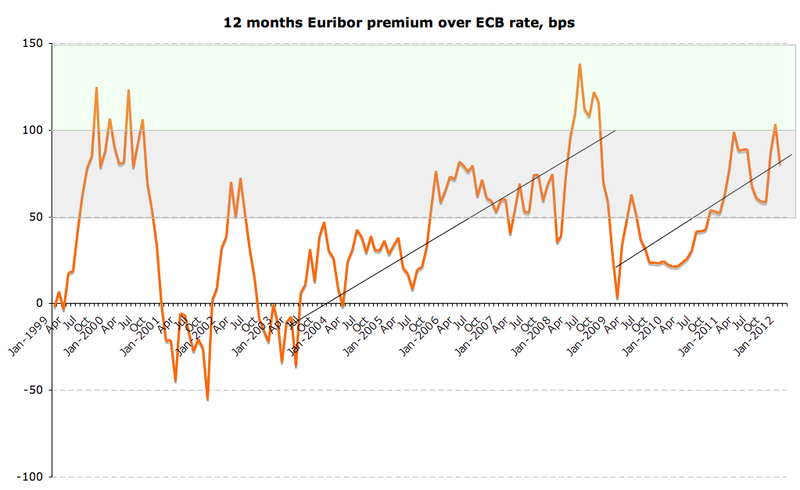 Mild bout of inflationary recession is still on the cards for the euro area for Q1. This is an edited version of my Sunday Times column from January 22, 2012. 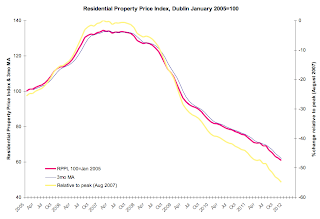 Back in 2004, with much fanfare, Fine Gael launched its ripoff.ie campaign that highlighted a large number of cases where policy-related or regulated price structures and practices have resulted in our cost of living falling well out of line with other Euro area economies. In 2009, Fine Gael launched a policy paper that was supposed to end Rip-off culture, including in state controlled sectors, once and for all. Fast-forward to today. Since elections, having abandoned its pro-consumer agenda, Fine Gael has done marvellously in playing a ‘responsible’ possum to Irish vested interests. 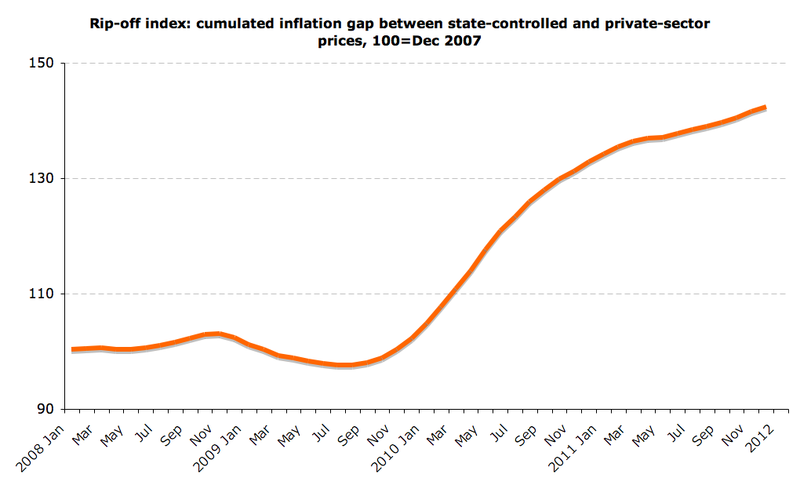 According to the CSO, year on year, consumer prices in Ireland rose 2.5% through December 2011. 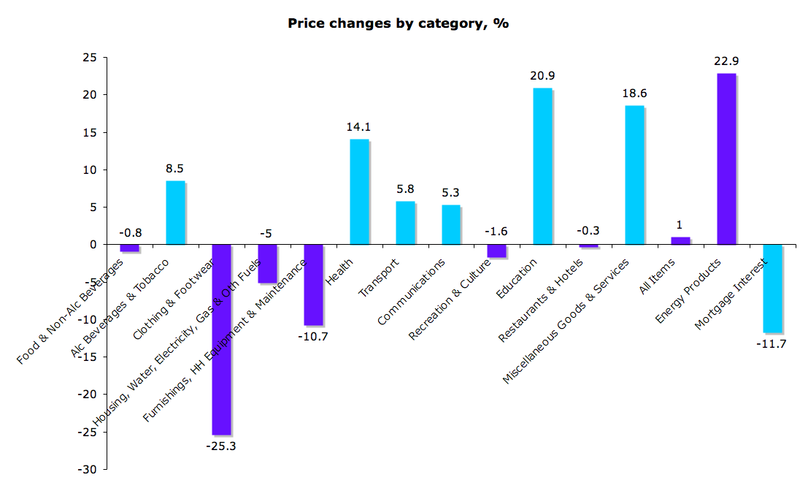 The range of these price changes across sectors, however, was dramatic. Clothing and footware prices were up 0.4% in 12 months through December, Furnishings, Household Equipment and Routine Household Maintenance prices fell 1.9%, Recreation and Culture deflated by 0.6% and Restaurants and Hotels costs fell 0.9%. Health costs rose 2.6%, Transport by 1.6%, Education by 8.9%. 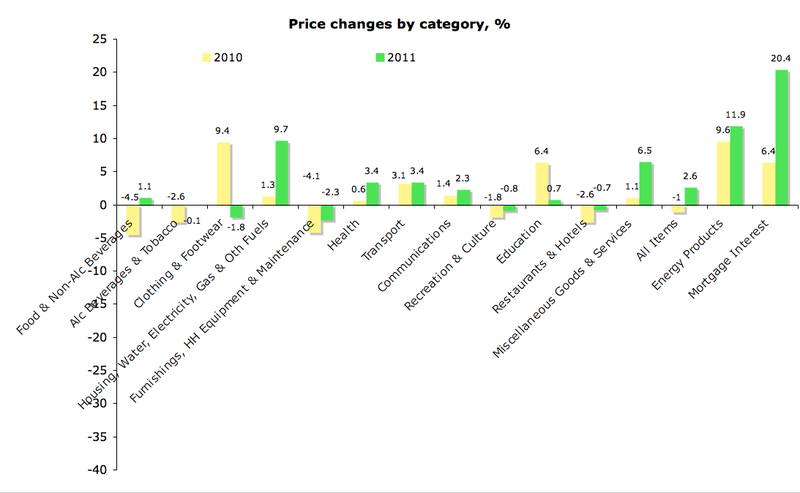 Majority of these price hikes have nothing to do with private firms ‘profiteering’. 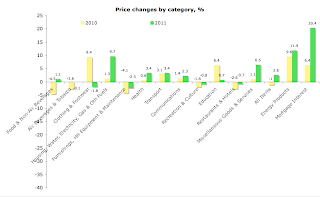 Per Purchasing Manager Indices, tracking the changes in input and output prices for goods and services, Irish firms and MNCs have experienced sustained shrinking of the profit margins since the beginning of the crisis, as consistent with deflation. Instead, the largest price increases, and ever expanding profit margins, took place in the sectors that, in the past, Fine Gael have correctly identified as being state-controlled parts of the Rip-off Ireland. 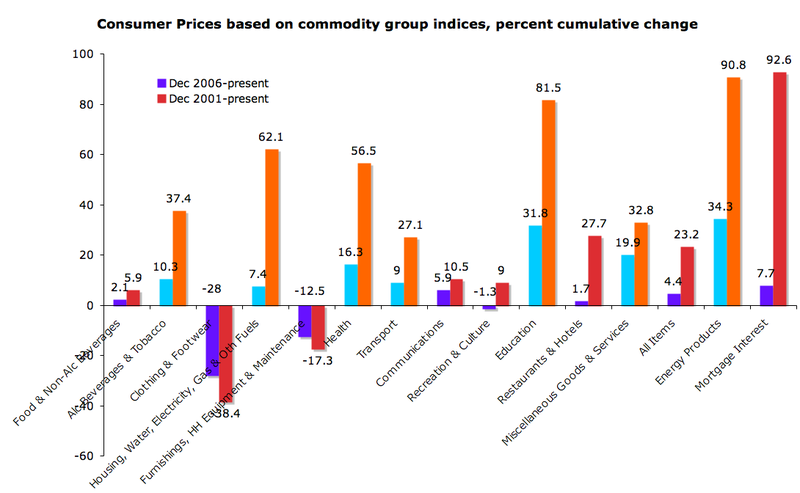 Food and non-alcoholic beverages prices are up just 5.9% in the last 10 years, cumulatively. State-controlled Tobacco prices are up 69.6% and Alcohol 21.6%. 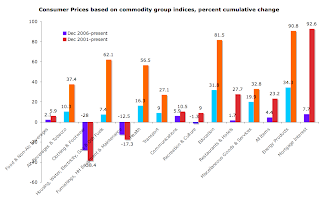 Housing, Water, Electricity, Gas and Other Fuels – single largest category of consumer spending – is up 64.4% on December 2001, with 90% increase in Energy Products costs, 63.3% increase in Utilities and Local Charges, and 99.1% increase in Mortgage Interest costs. 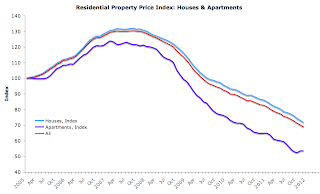 In the last five years, Rents have fallen 8%, while Mortgage Interest rose 11.3% despite the fact that ECB rates have dropped 2.5 percentage points over the period. Electricity prices are up 28.3% in 5 years and 11.5% in the last year alone, despite the fact that natural gas prices – the main generation source for Irish electricity – have declined worldwide. While Fine Gael cannot be blamed for the full extent of price hikes since 2001 or 2006, the current Government bears responsibility for failing to address state-controlled inflation since taking the office. The above sectors are indirectly controlled by the state via regulation, state ownership of banks and enterprises, and indirect tax measures. But what about those costs more directly set by the Government? Health costs are up 56.5% on December 2001, Education is up 81.5%. In Health, the core drivers of inflation have been Hospital Services (up 40.2% since December 2001 and 9.8% in 2011), Dental Services (up 20.6% in 5 years, but down 0.3% in the last 12 months). Meanwhile, prescribed drugs prices are down 11.3% on 2006 and 4% in the last 12 months. Health insurance costs are up 75.7% and 22.9% since December 2006 and in the last 12 months, respectively. This in a country with younger population and well-established trends in terms of demand for healthcare. In contrast, vehicles insurance – privately provided and similar in predictability of total claims risks – inflation since December 2006 amounts to just 9% and 0.9% in the last 12 months. Same story of the state-led rip-off is replicated in the Transport sector. Here, overall costs are up 9.3% in the last 5 years, but bus fares are up four times as much. Privately controlled costs of buying vehicles have declined 15.4%, while state-set motor tax rose 14.3%. Ditto in Communications, where telecoms services costs are up 5.8% in the last 5 years, but postal services up double that. In two sub-sectors of education where the Government has least power to influence prices – Primary Education and Other education and training – inflation is the lowest. The highest price increases are in the third level education, with prices up 50.1% in just 5 years (13.4% in last 12 months alone). The above clearly shows that the Government and the semi-state bodies and enterprises it owns, along with the banks are at the heart of the extortion racket that is our cost of living. Over the recent years, rapid deflation in prices and costs in the private economy has been offset by the rampant inflation in prices and costs in the state-controlled and regulated sectors. In majority of cases, this inflation was directly benefiting state and semi-state employment, management and Government coffers. In all cases, the costs were directly impacting Irish consumers who are left with no meaningful choice, but to comply with the pricing structures set in the markets. Meanwhile, Budget 2012 clearly shows that the Government is hell-bent on extracting ever-higher rents out of consumers through taxes and charges. For example, the Government has introduced increased mortgage interest relief that amounts to €52 million in help for most indebted-households. But the very same Government refuses to intervene in the banks’ internecine policies of shifting the burden of losses from trackers onto the adjustable rate mortgagees. The households that the Government finds in the need of increased mortgage interest relief will be liable for the new Household Charge. And, if Minister Noonan has his way, mortgagees who default on their loans will pass into outright debt slavery to the banks. There are more direct inflation-linked or inflation-raising taxes, such as VAT. Increase in the VAT rate simultaneously pushes up the overall tax component of all goods and services sold in the state that are taxable at the higher rate (an increase in inflation of some 9.5% for those items) and increases the costs of all goods and services that are dependent on intermediate inputs. Excise tax on tobacco comes against the Revenue Commissioners’ analysis showing that tobacco taxes have reached, even before Budget 2012 measures are factored in, the point where higher taxes harm receipts and fuel black markets. And Carbon Tax quadrupling from €5 per ton to €20 per ton has been responsible for some 2% rise in inflation in fuel and related activities. Motor tax increases, accounting for double the share in an average household expenditure that accrues to bus fares, are going to directly drive up the cost of transport. Increases in State charges for hospital beds are expected to raise the cost of healthcare for middle class patients by some €268 million in full year terms. Health insurance levy hike further compounds this inflationary grab-and-run approach to policy. Secondary education ‘savings’ are likely to see parents being forced to cover much of the gap in funding out of their own pockets. Third level measures, while relatively modest in size, will compound massive inflation already accumulated in the sector over the last 5 years. By the metrics of the Budget 2012, the current Government didn’t just mothball its pre-election ideas on reducing the reach of the State-sponsored Rip-off Ireland, it has actively moved to embrace the cost-of-living increases through indirect taxation and encouraging avarice of the semi-state commercial bodies and dominant near-monopolies. 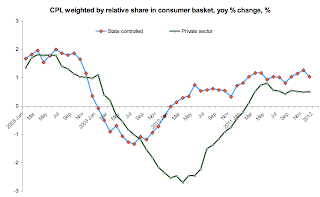 All of which means that the path to economic recovery we continue upon is the path of deflationary spiral in private sector economy, with mounting unemployment and businesses insolvencies, offset by the unabated cost increases when it comes to the meagre services the State does supply or control. Following an almost 11% month on month decline in trade surplus in October, Irish exporters have posted a record-breaking return to health in November, bucking all expectations. The market consensus was for the Irish trade surplus (merchandise trade only) to decline marginally to ca €3.4 billion in November. 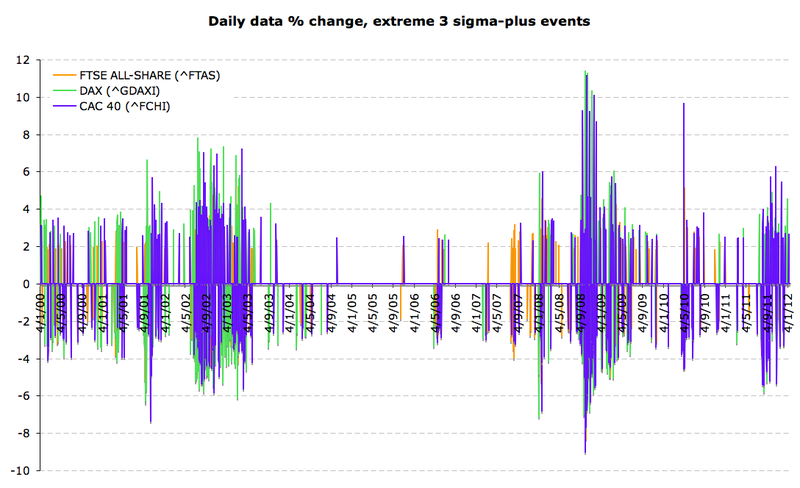 Instead, the trade surplus rose – on seasonally adjusted basis – to €4.31 billion – the highest on record. In 11 months through November, cumulative merchandise trade surpluses now amount to €40.53 billion or 1.6% ahead of the same period in 2010. As before, the core drivers of trade surplus were exports increases in Organic Chemicals, and Medical and Pharmaceutical products, while indigenous exports rose significantly during the last year in Dairy products category. The latest data highlights the resilience of the Ireland-based MNCs’ exporting capabilities, providing continued contrast to the majority of our counterparts in the Euro area ‘periphery’ who have been posting dramatic slowdowns in exports and deepening trade deficits since the beginning of Q4 2011. "To ensure debt sustainability for Greece, it is essential that a new program be supported by a combination of private sector involvement and official sector support that will bring debt to 120 percent of GDP by 2020. The Fund has no view on the relative contribution of private sector involvement and official sector support in achieving this target. 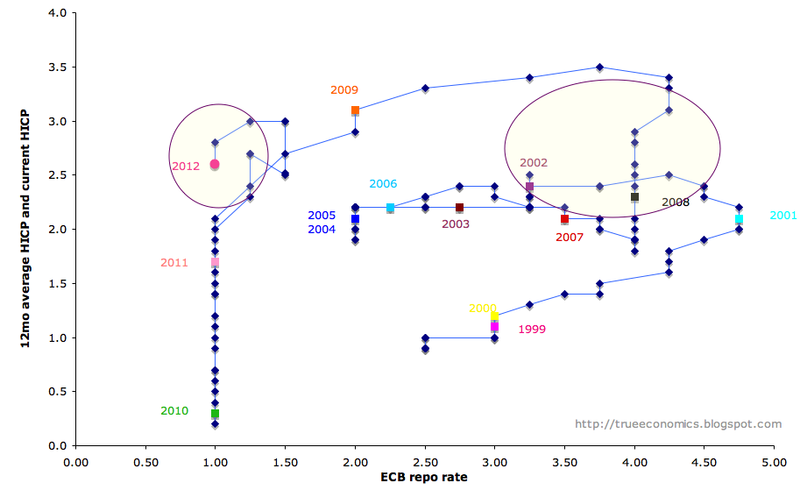 In line with this view, the IMF has not asked the ECB to play any specific role." So IMF is making a pre-emptive announcement of 'neutrality' on the issue of the day - who'll be blamed when Greek PSI talks eventually end up in the courts and Greek debt/GDP ratio shoots past 150% mark. And here's IMF own December 2011 report on Greece (available here)"
"The previous July 21 financing package [agreed for Greece] would not work. 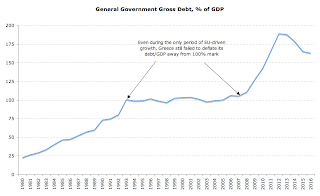 Public debt would peak at 187 percent of GDP in 2013 and fall to 152 percent of GDP by 2020. Net external debt would peak at 128 percent of GDP in 2012 and fall to 96 percent of GDP by 2020. 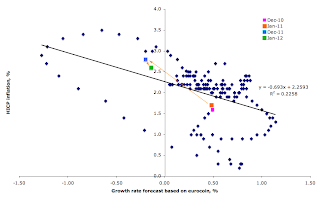 These already weak downward trajectories would not be robust to shocks. 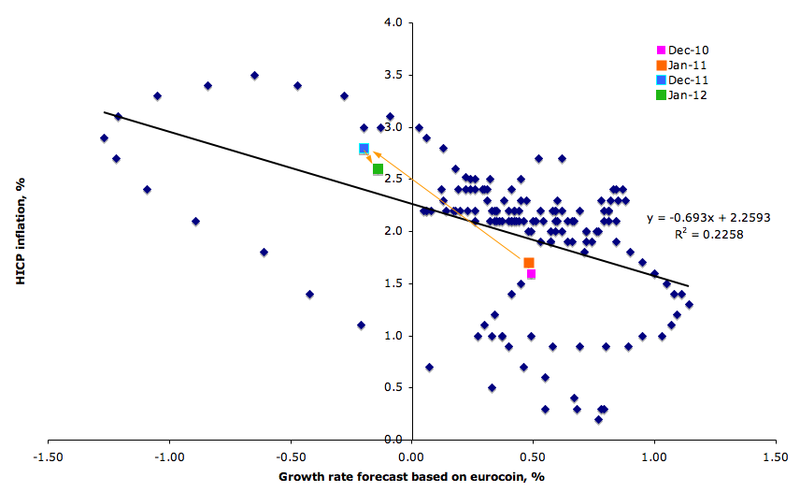 With near-universal participation in a debt exchange targeting a 50 percent face value haircut and offering a low coupon, and European support at an interest rate of about 4 percent, debt could be brought to 120 percent of GDP by 2020 (the maximum level considered sustainable for a market access country). 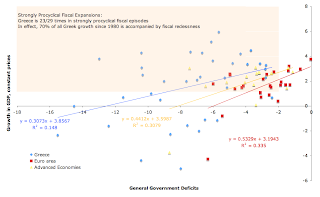 The trajectory would also be less susceptible to shocks (including to the official sector funding cost), although a longer period of time would be required to bring debt-to-GDP below 120. 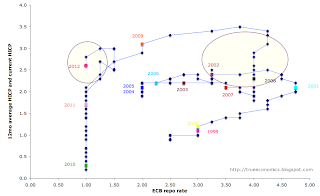 However, with low participation in the debt exchange and a significant amount of hold outs to be amortized with European support—a real risk under a purely voluntary approach (i.e., an approach not involving any measures to induce higher participation levels)—debt could stick above 145 percent of GDP in 2020. 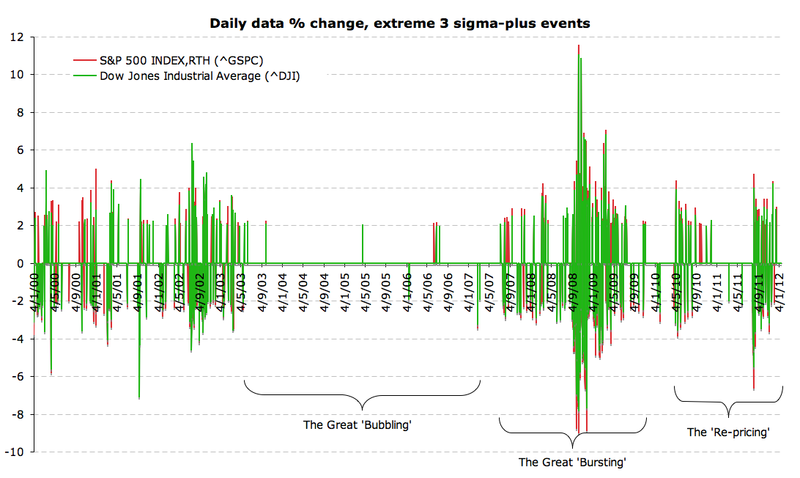 Moreover, the trajectory would no longer be robust to the usual range of shocks. Thus, securing a sustainable debt position will depend on whether PSI negotiations deliver the targeted €100 billion in debt reduction, in particular on the ability of the features of the exchange to deliver near-universal participation." According to the report in FT Alphaville (link here) Ireland has 'returned' to the bond markets by carrying out a swap of a 4% coupon 2014-maturing bond for a 4.5% coupon 2015-maturing bond. 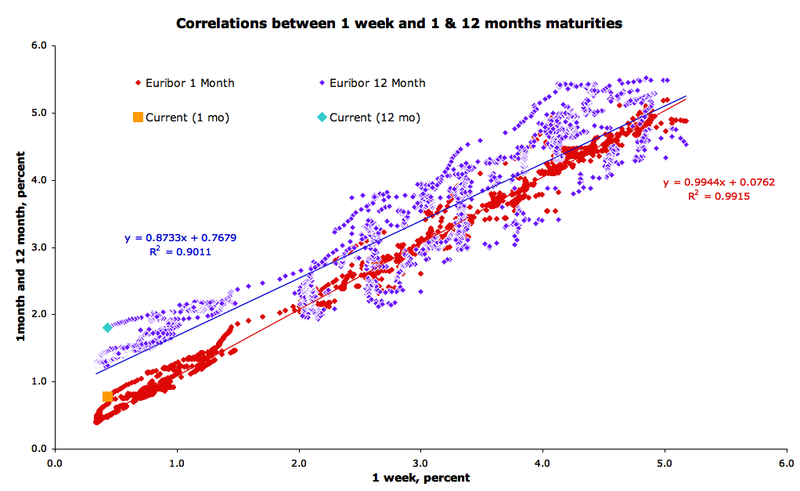 This reduces 2014 outgoings on redemption of maturing bonds and forces more maturity into 2015, which has more benign profile. But the switch comes at a price - the coupon is up 12.5% on previous. In effect, if this is less of an Ireland's 'return to the bond markets', more of Eddie 'The Eagle' Return to the Olympics type of an event. Much pomp (official announcements and Government statements to follow), no circumstance (Ireland still cannot fund itself outside the Troika agreement), and even less real substance (avoiding a total blowout in 2014 is now clearly an objective for policy measures). But hey, let it be a much needed 'green jerseying' distraction, as FT Alphaville suggests, to the gruesome reality of Ireland torching another €1.25 billion worth of taxpayers' funds on that pyre called IBRC/Anglo. 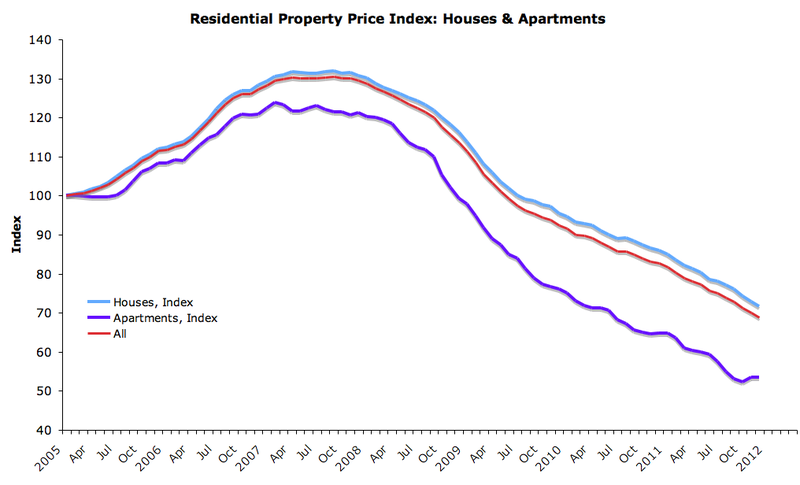 Rates of decline (monthly) are greater than 1.5% (12mo average) for 3 months in a row for all properties and for houses. Another heated non-debate is sweeping Europe. In the latest round of bizarre, outright Kafkaesque rhetorical contortions, European leaders are now engaged in a heated discussion on the 'enlargement' of ESM. Alas, the whole thing is clearly heading for the same outcome as Europe's previous rounds of 'solutions'. Here's why. Recently, as reported in German press (here) Angela Merkel started to yield on the idea that the 'permanent' ESM fund should be increased from €500 billion to closer to €1 trillion by, among other things, allowing for concurrent running of existent €250 billion EFSF facility and the setting up of the new ESM. Sadly, this 'solution' is really a complete red herring, despite all the hopes the EU is pinning onto it. In fact, it so much of a fake, the markets are simply likely to laugh their way through it. The EFSF is designed to run out of time in the end of 2013. ESM is designed to start the earliest in mid-2012. 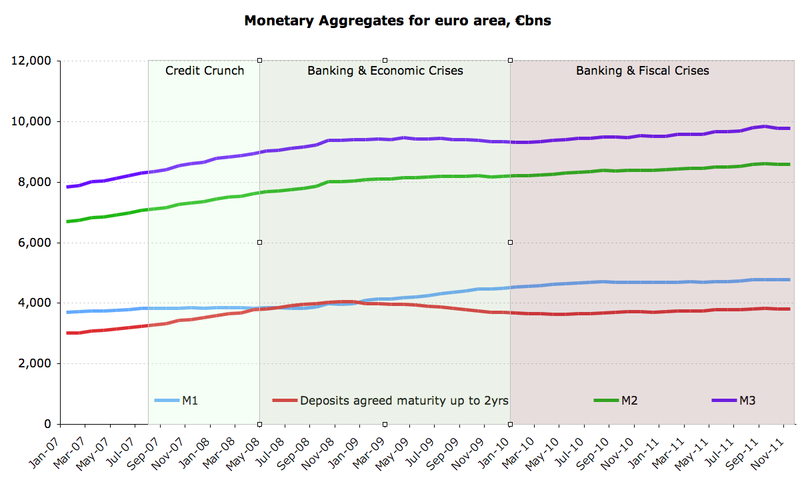 Which means that even in theory, combined ESM/EFSF can last not much longer than 12 months. In practice, however, even this is not going to happen. Firstly, EFSF is becoming increasingly funded through short term debt issuance and this means that as we hit 2013, the rate of EFSF paper maturing is going to accelerate. To roll this into longer-dated paper will require more than just re-writing the statutes of the EFSF. It will require EFSF raising funding at the same time as ESM is raising funding. The likelihood of this being a successful market funding strategy is zero. 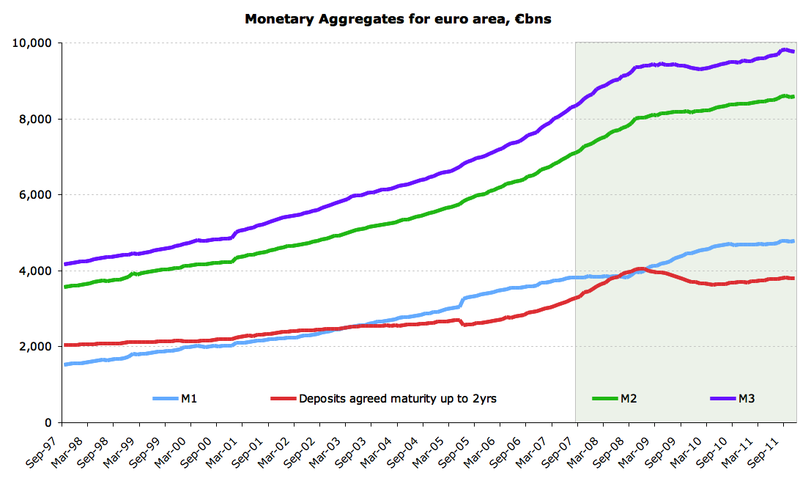 Secondly, ESM capital basis of (meagre) €80 billion is not going to be fully invested on the initiation of the fund. 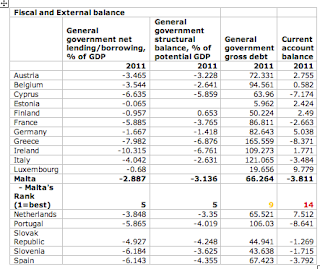 Which means ESM even in theory is not going to come out on day 1 and borrow full €500 billion capacity. In practice, it can't be expected to raise even 1/4 of that in the first year of operations. Which means that even running concurrently, EFSF+ESM duo will not constitute a fund with anything close to €750 billion capacity. And this means that European leadership is clearly in line for winning the Global Non-Leadership Prize again this year. 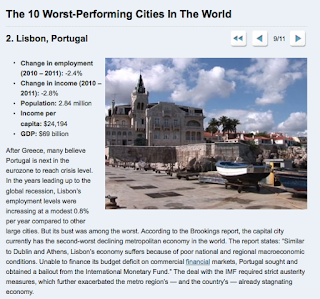 IMF, insisting on the concurrent running of EFSF/ESM as well, is going to be a runner up. Lovely, aren't they? 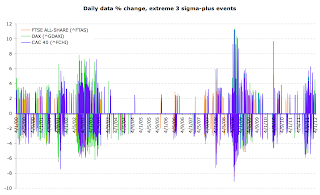 But the trick in the above is: we are not at the decay stage of volatility on the sovereigns re-pricing stage. This, to me, suggests that once the sovereign crisis re-pricing draws to conclusion (whenever that might happen - isa different story), there will be the need for finding that 'new normal' (reversion-to-the-trend target) for the markets valuations overall. And that is the whole new game, dependent less on the previous equilibrium that should have followed the Great Bursting period, but more on the future risks and trends in post-debt economies. Which, itself, really depends on whether any given market can sustain growth without endless supports (implicit and explicit) from the Government borrowings. 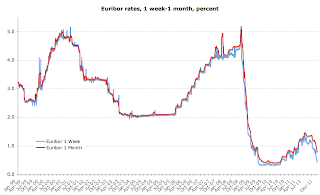 22/1/2012: What do interbank lending rates tell us about risk valuations? 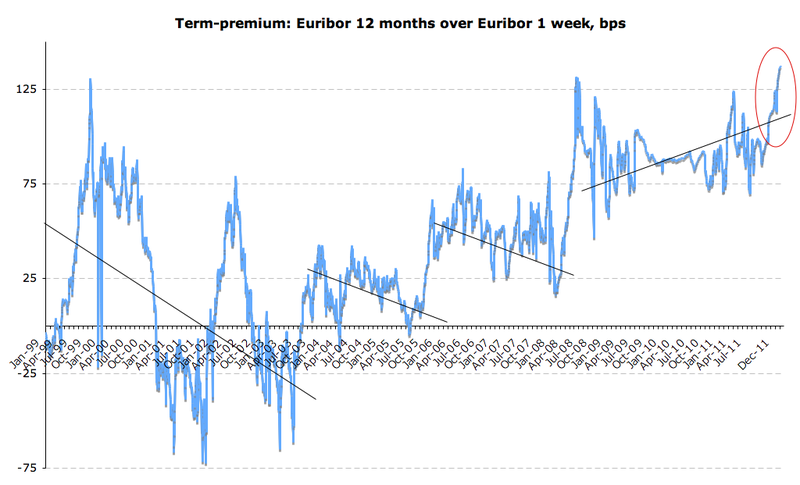 Note: the last chart above is not seasonally adjusted and, with exception for 2010, euribor rates tend to fall seasonally in January compared to December. 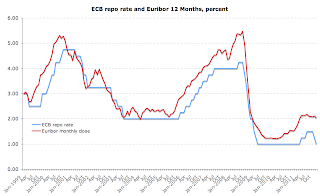 The above suggests to me that what we are observing in the liquidity markets is a combination of some improvement due to ECB's LTRO move (substitution along maturity curve) and the (very) incomplete pass through of ECB rate change to funding markets. There appears to be no evidence in risk reduction anywhere in sight. So we used to have an 'Innovation Island' here that was run by the Deputy PM who confused Einstein with Darwin. She was directly in charge of Innovation policies. "Michael Noonan, Ireland's finance minister, criticised the involvement of private creditors in the [Greek PSI] talks, arguing that it had made the crisis worse. Mr Noonan told the German newspaper Sueddeutsche Zeitung it had been a "fatal" mistake to involve the private creditors and this had "driven the markets crazy". He said that markets would only calm when they were convinced that eurozone countries were making serious efforts to solve their debt problems." So, 'markets are crazy' and proper risk sharing with private investors in the case of insolvency is a 'fatal mistake'. Does Minister Noonan believe in slavery? Because if he doesn't then there is no alternative in the case of Greek crisis resolution options to PSI. Of course, Minister Noonan believes in slavery - the modern variety of it - slavery that subjugates those who do not emigrate from Ireland to decades of involuntary repayment of privately accumulated debts they did not contract to accumulate. Minister Noonan has no problem with the Government of Ireland simply undertaking all private debts of a private insolvent banks and forcing ordinary people - not shareholders or lenders to these banks who were paid to take the risks in the first place - to repay them. Just like that. Without any consent: "Give us your money, granny, or else!" But there's more to the statement above, which shows Minister Noonan in an equally unpleasant light. You see, Minister Noonan swears by the wisdom of the IMF and the ECB and the European 'partners' when it comes to his domestic policies. He did so officially earlier this week when he used Troika endorsement of Ireland's 'progress' in the programme as the reflection of their support for his policies. 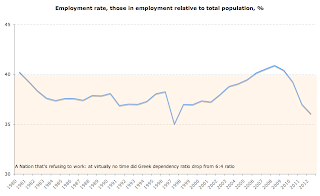 Yet, it is the very same Troika he so blindly follows into Ireland's economic oblivion which deemed Greek debt levels unsustainable - aka non repayable even were the modern day debt slavery terms (as imposed in Ireland) deployed in Greece as well. So, for all our Irish concerns about the sanity of the Troika 'solutions' for Ireland, there's an even greater concern that should be preoccupying our minds - concerns for the positions taken by our own national leaders. And for all those would-be foreign investors into Ireland - please remember, you are about to invest in the economy run by those who think that 'markets are crazy' and contracts for risk pricing are 'fatal mistakes'. PS: Never mind, Minister Noonan's only plan for Ireland is to attempt, asap, borrowing in the 'crazy' markets to finance his 'sane' fiscal management strategies. This story in the Irish Times yesterday clearly requires a comment. So here it goes. Here's the best time-line and explanation as to Minister Noonan's 'efforts' to secure 'savings' on the Promissory Notes. "A senior German official said Berlin could envisage extra programme funding being used for the Irish banking sector not currently earmarked for this purpose." Ireland still has some funds due under the original 'bailout' that were earmarked for banking measures, but were not yet used in the last recapitalizations round in July 2011. 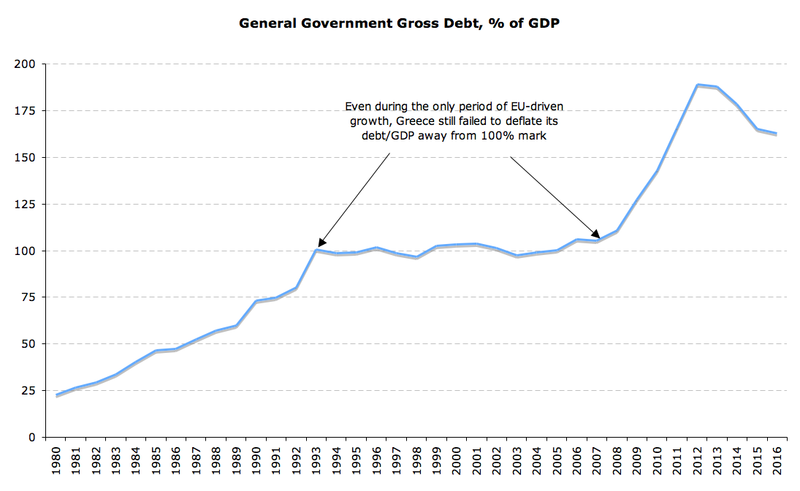 This will not in itself constitute any new measures materially impacting Ireland's Government debt projections. It will not constitute a second bailout (as the funds are already earmarked under the first bailout), but by reducing funding available for fiscal and other banking requirements it will increase the probability of such a bailout in the future. 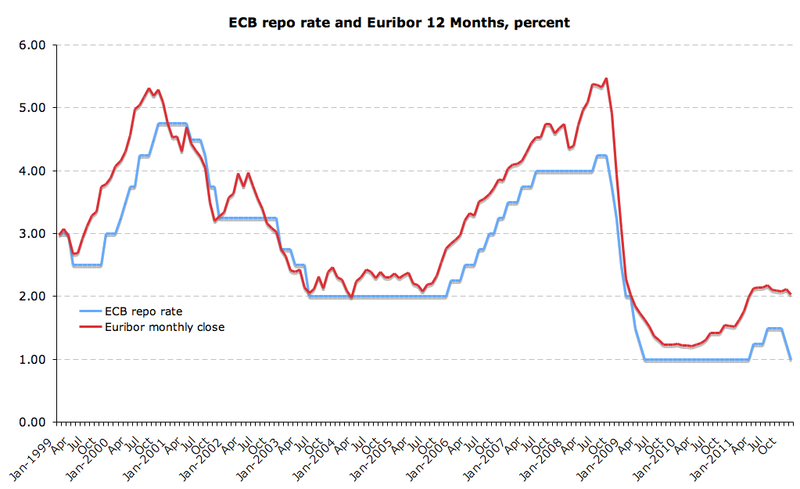 Ireland can be allowed to borrow more from the EFSF/ESM, swapping the Notes for marginally cheaper funding. 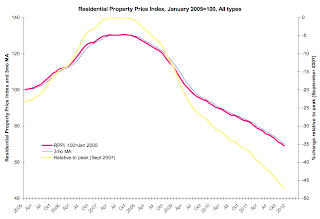 This too will not constitute any material impact on Ireland's Government debt projections. But it will constitue a second bailout. Neither option involves any possibility for 'private sector involvement' and at any rate, Minister Noonan's reference to PSI is a red herring - there can be no PSI in relation to the Promissory Notes as these do not involve private investors or lenders at all. However, both (1) and (2) have material impact in terms of Ireland requiring a second bailout - both increase materially the probability of such an eventuality. Lastly, there is a catch. The problem of capital adequacy, highlighted by Minister Noonan, means that 'financial engineering' can only involve temporary relief in terms of payments timing, not material relief in terms of NPV of the debt assumed by the state under the Promissory Notes. We will be allowed to borrow more time. At a cost of longer loans, and more repayments in the end. Which, of course, does nothing to achieve sustainability of the 'solution' from the point of view of us, taxpayers, who Minister Noonan expects to pay for all of this. But it probably does give him a chance of holding a 'triumphant' pressie announcing some sort of a 'deal'. "...it has been four months since Minister Noonan’s meeting with the ECB and others in Wroclaw where he, to use his own words “had a ball to kick around” and has proposals. It is two months since Enda Kenny discussed the matter with Angela Merkel. It is more than two months since Minister Noonan said that “technical discussions” were ongoing. And yet the Troika yesterday downplayed any progress in the matter saying that Minister Noonan had merely “requested discussions”." Or maybe, just speculating here, Minister Noonan is bringing up the Promissory Notes once again this week because next week we are about to repay another tranche of Anglo bonds? Last month, around the time of the repayment, there was much-a-do-about-nothing going on in referencing the very same Promissory Notes? However, there is, in the end, something openly honest about Minister Noonan's windy trip down the 'Imagine the Superhero, ya Villain' lane. 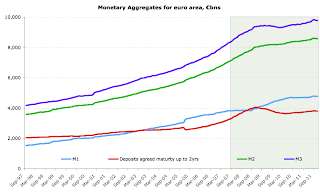 "[Minister Noonan] said he hoped that the ECB would extend its programme of low-interest loans beyond next month to improve euro zone bank liquidity in the hope it would stimulate the market in longer-term sovereign debt papers." Point 1: LTRO-2 was already announced, so Minister Noonan is either uninformed, or pretends to be uninformed to posit himself as a a heroic 'rescuer' proposing a real 'solution'. Point 2: Minister Noonan clearly shows that his sole concern is how to raise more debt for Ireland. Not how to balance the books (in which case he shouldn't need banks to pawn their assets as ECB to buy Government bonds with this fake cash), or reform the economy (in which case growth would resume and the State shall not require the said scheme, again) and not with restoring functional banking system to health (since functional healthy banking system lends to the real economy, not to Minister Noonan). Here are some extracts from an excellent contribution by Peter Mathews TD (FG) from yesterday's topical debates in the Dail (full record available here). 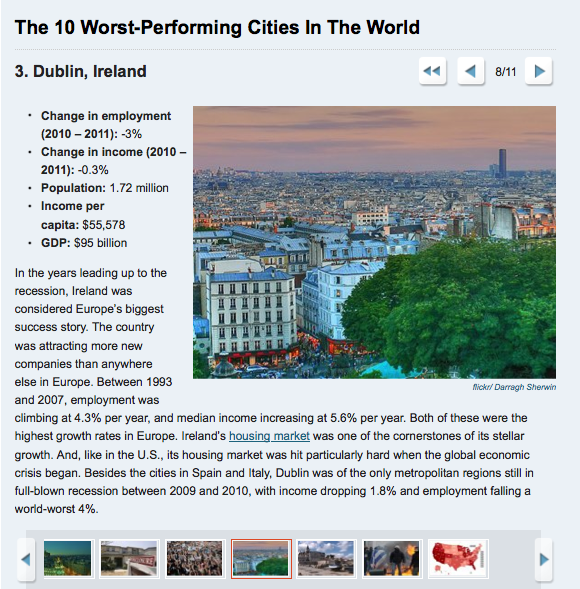 This was comprehensively overlooked in the media reporting which focused solely on the non-event (save for Vincent Browne's questions) of the Torika 'approving' Ireland's 'progress'. My comments in italics. Next Wednesday, 25 January, is the due date for the redemption of a bond issued originally by Anglo Irish Bank Corporation, now the Irish Bank Resolution Corporation. We are at an important financial crossroads in the history of our country. Anglo Irish Bank has been insolvent and supported by financial engineering, promissory notes and the emergency liquidity assistance of the European Central Bank and funds from our Central Bank. The debt that lies embedded in what was Anglo Irish Bank was not created by the citizens of this country. It has been meted out onto their backs by a mixture of incompetence and mismeasurement over a certain period under the past Administration. Consider the debt of €1.25 billion. The attention of the creditors will be in sharp focus because the banking system, the Irish-owned banks, are in debt to the ECB and our Central Bank at a level of approximately €150 billion. It is the forbearance and tolerance of citizens that keeps the financial edifice and engineering of the eurozone and the greater financial system of the developed world in place. We have been doing considerable work, facing enormous challenges. Through the great work of the Minister for Finance, Deputy Noonan, and the Taoiseach, we are bearing the load of trying to bring about a fiscal adjustment in line with the troika agreement signed in November 2010. All that work is important and must be done but the legacy debt is outside the responsibility of the people of this State. One and a quarter billion euro is almost half the budget [measures] introduced in December. It is eight times the sum that will be raised from the household charge and twice that which will be raised by the VAT increase. The debt crisis in Ireland and other countries cannot be solved by adding more debt... Loading more debt on this country to pay legacy debt is like suggesting a drink problem can be solved by another whisky. The Government has committed to ensuring that there is no forced or coerced involvement by the private sector burden sharing on Irish senior bank paper or Irish sovereign debt without the agreement of the ECB. This commitment has been agreed with our external partners and is the basis on which Ireland's future financing strategy is built. While the cost to the Irish taxpayer has been and will remain significant, the Government clearly recognises the need to work as part of the eurozone in order to ensure a return to the funding markets in the future. The only EU state where private sector involvement will apply is Greece. 15. As far as our general approach to private sector involvement in the euro area is concerned, we reiterate our decision taken on 21 July 2011 that Greece requires an exceptional and unique solution. 16. All other euro area Member States solemnly reaffirm their inflexible determination to honor fully their own individual sovereign signature and all their commitments to sustainable fiscal conditions and structural reforms. 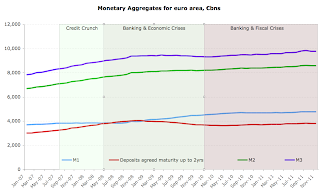 The euro area Heads of State or Government fully support this determination as the credibility of all their sovereign signatures is a decisive element for ensuring financial stability in the euro area as a whole. 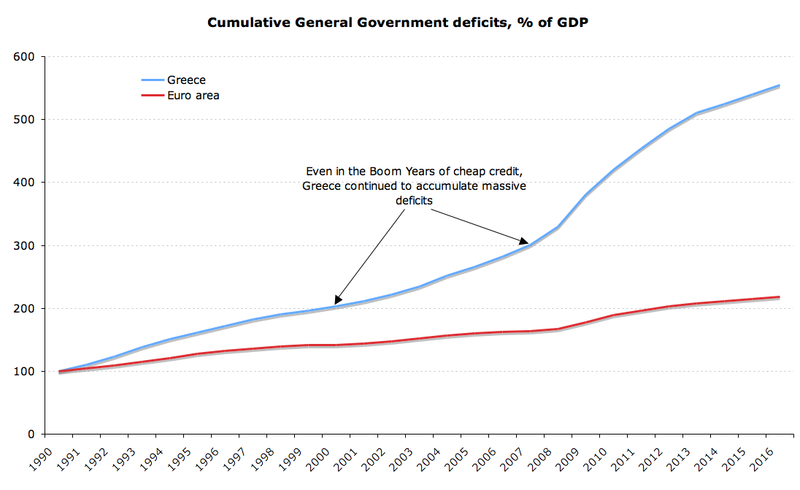 While I will not get into a long debate, Greece will be the beneficiary of at least a 60% write-down of its debt obligations. The Greeks got the attention of their creditors by going out in the streets and having riots and by people being killed. We have knuckled down to correcting a fiscal imbalance and, at the same time, we have stayed silent. We have been straitjacketed by the legacy debt. Our loan losses in the banking system were €100 billion. While I know the shareholders and some of the subordinated bondholders suffered, the remaining losses were in the banks without being declared. The ECB stepped in to redeem bondholders to date, which was a mistake. We are compounding the mistake by going along the same route now. We have got to be honest about it and open up the discussion. We are not defaulting; we are opening a discussion. I made the point that we cannot pay. I use the word "we" euphemistically or collectively in regard to the bank and the State. We cannot pay because of the guarantee that extends over the bank. It is a case of us lifting the telephone and asking, "Can we have your attention, please?" We cannot pay and we want to open a discussion and explain to exactly how the creditor liabilities of our banking system remain, and how they should be written down. There is further writing down to do. We have a €60 billion to €75 billion of write-down to organise and negotiate. To use an analogy, we have a steeplechase race with about four miles to go. We have big jumps ahead. Normally, a steeplechase horse will start with about 12 stone on its back. Ireland's legacy debt of private debt, non-financial corporate debt and national debt when it peaks out at €120 billion is the equivalent of 24 stone on the back. It is not a possible race to run. Do you spot much of drama here? No? How about a snapshot? 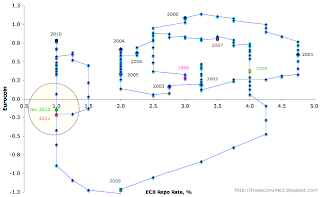 No prizes for guessing an answer: there is no drama in monetary policy path chosen by the ECB through the entire period of August 2007-present. None. Which, of course, is surprising, as outside the euro monetary policymakers halls, there was and still is plenty of drama - from banks liquidity crunches, to sovereign debt crises, to sovereign deficits crises, to recessions and double-dips, to unemployment rising, to banks assets valuations crisis, to inflation falling out of sync with FX valuations, to sovereign credit crunches, to socialization of banks losses... and so on. All of the above should have an effect on a monetary policy. 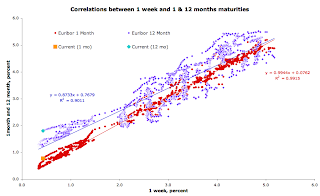 Some in less interventionist fashion (but with at least an ex post correlation to the aggregates), and some with more interventionist fashion (with monetary policy being a major tool for dealing with them). Alas, all is calm, trend(y)-like in the well airconditioned offices of ECB. "The theory of economics does not furnish a body of settled conclusions immediately applicable to policy. It is a method rather than a doctrine, an apparatus of the mind, a technique for thinking, which helps the possessor to draw correct conclusions." A question to Keinesianistas, then: Why on earth would you argue that for every recession in every country, there is only one solution that is fully anchored in one Aggregate Demand identity? And that - irrespective of the nature of the path an economy takes into a recession or its underlying causes, irrespective of the economic conditions at the onset of the recession? There will be a much more detailed analysis of the state-sanctioned rip-off that is revealed in the latest data from CSO on Irish consumer prices in my sunday Times article this weekend, so stay tuned for that, but here are some numbers from today's release. Lighter blue are categories that have either full or significant share of prices set or influenced directly by Government policies. 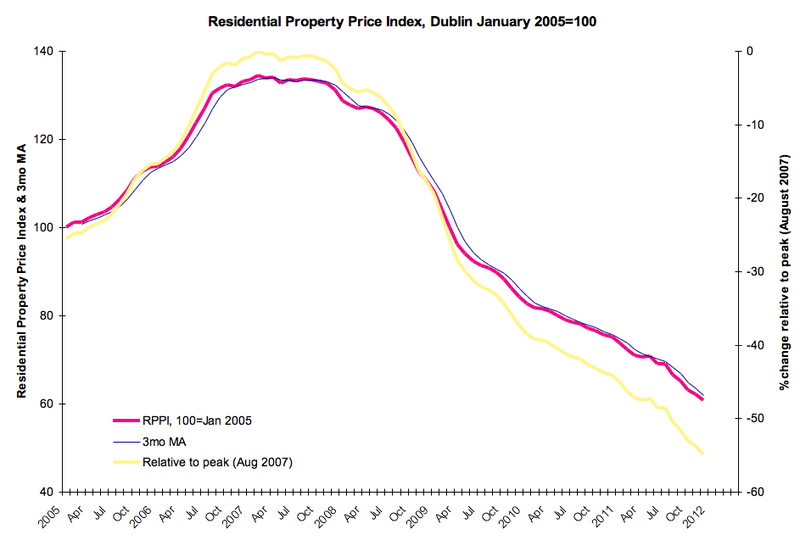 One thing to note: mortgage interest costs which, per CSO data have fallen 10.7% in 2007-2011. Of course, this conceals the fact that since the Irish State took over most of the Irish banking sector, in 2010-2011, mortgage interest costs are up cumulated 28.11%. 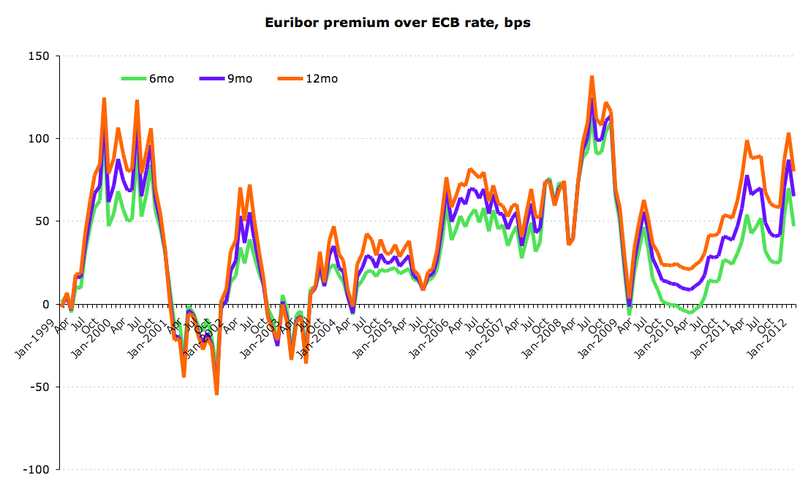 Over the same period of time, ECB rates have moved from 1.0% in January 2010-March 2011, to 1.25% in April-June 2011, to 1.50% in July-October 2011, to 1.25% in November and 1.0% back in December 2011. 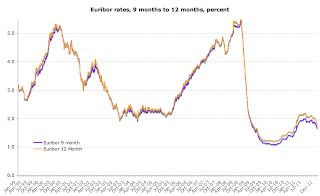 In other words, the average rate has gone DOWN from 1.23% in 12 months pre-January 2010 to 1.13% in 24 months since then. And yet, mortgage interest keeps on climbing... up whooping 20.4% in 2011 alone. Yet another useful comparative that is concealed by the above data is that while mortgage interest costs might be down 11.7% on December 2007, they are up 7.7% on December 2006. 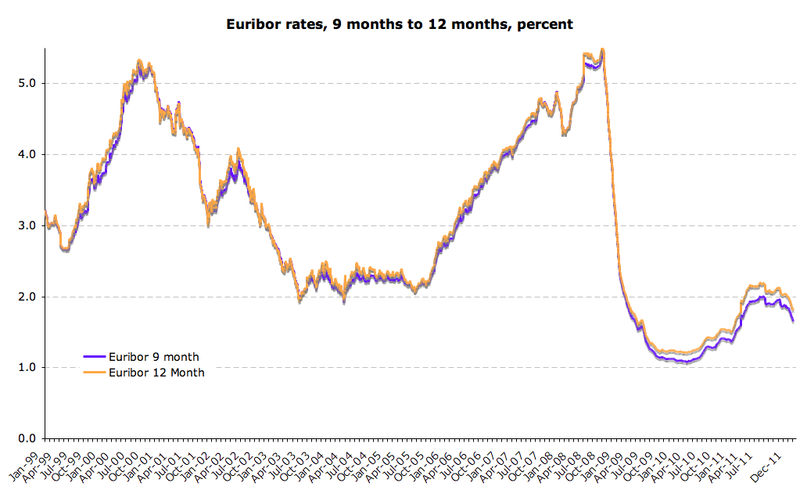 Now, in December 2006, ECB rate was 3.5% or 2.5 percentage points above where it was in December 2011. So let's take a look at slightly longer horizons. 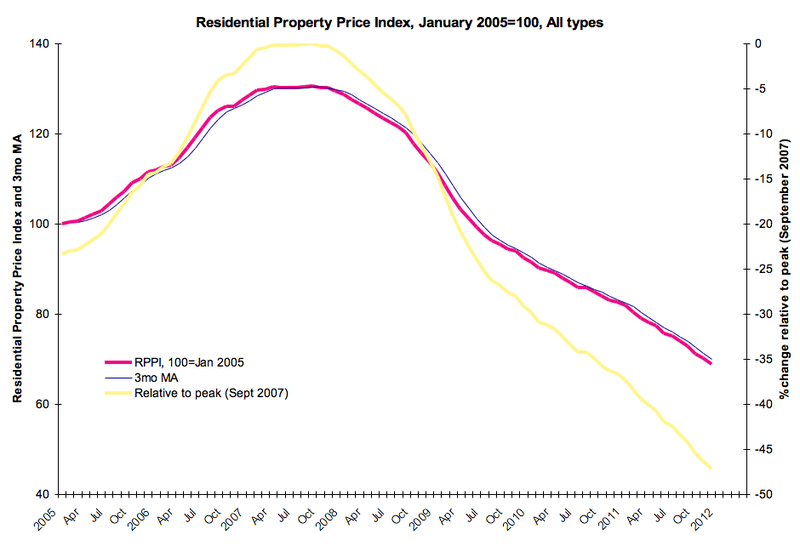 Chart below show cumulated price changes between December 2001 and present and December 2006 and present also courtesy of the good folks of CSO. Again, the same story - the higher the price increases, the more likely we are dealing with directly regulated or state owned enterprises-dominated or state-controlled sector. More detailed analysis in my forthcoming Sunday Times piece this week. What part of (1)-(7) above constitutes 'successful completion' of the review?" 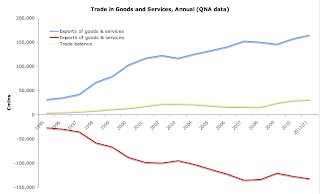 While we are on trade data (see previous post on November 2011 merchandise trade stats here), let's also update full trade stats for QNA results for Q3 2011. 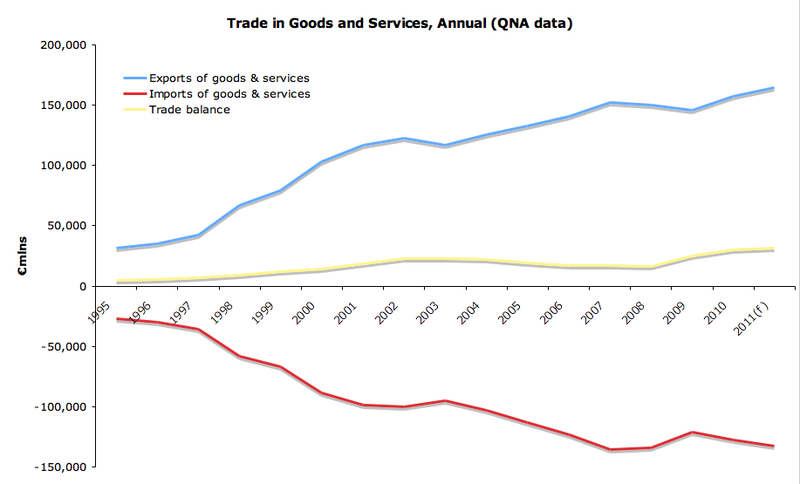 This covers all trade - merchandise and services, so it paints a full picture of our trade balance. 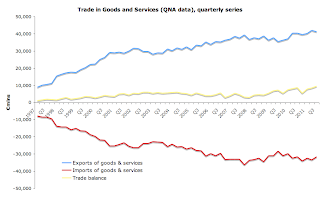 Exports of goods and services fell from €41.945bn in Q2 2011 to €41.186bn in Q3 2011, a decline of 1.81%. 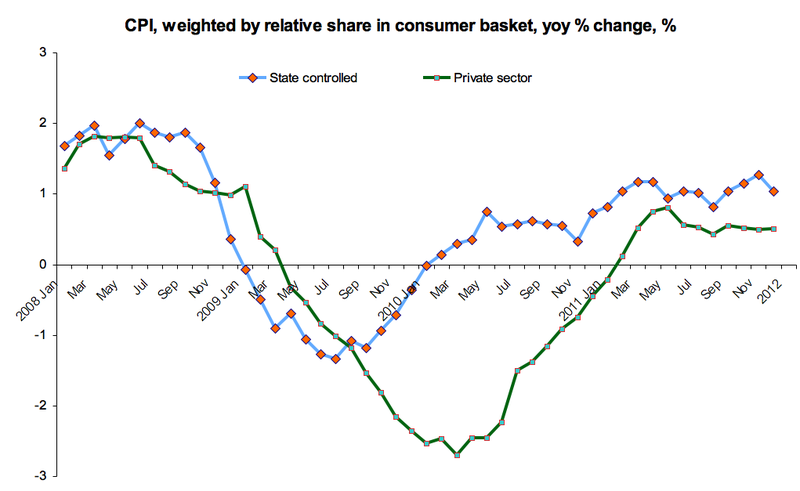 This comes after a qoq rise of 4.34% in Q1-Q2 2011 period. Year on year, Q2 2011 saw exports rise 3.78% and Q3 saw an increase of 1.91%. Despite the slowdown, Q3 results was still the second best quarterly exports performance on record. 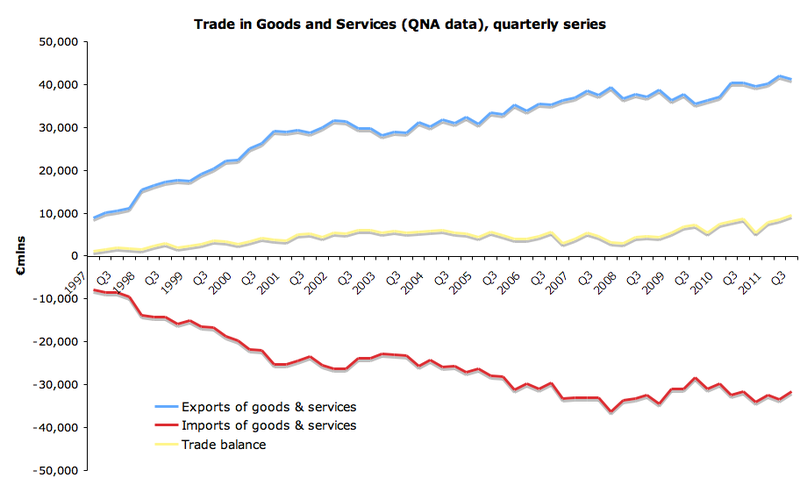 Imports of goods and services shrunk in Q3 2011 to €31.6bn, down 5.45% qoq, which comes on foot of a 3.06% rise qoq in Q2 2011. 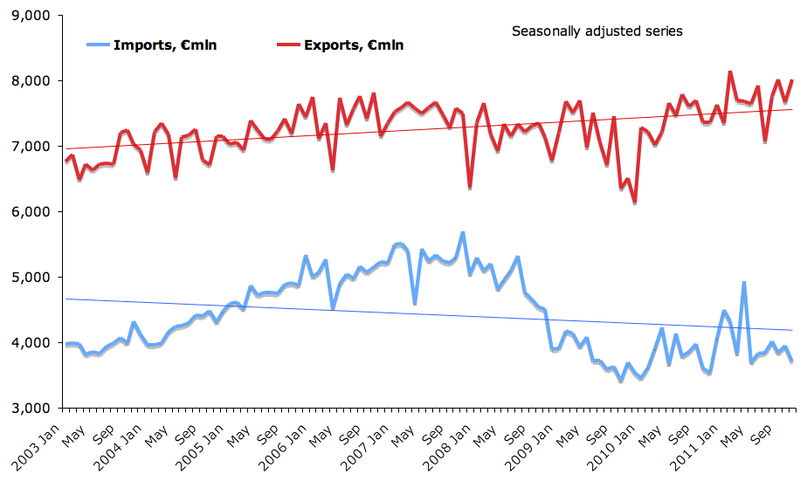 Year on year, imports were up 3.3% in Q2 2011 and are down just 0.29% in Q3 2011. 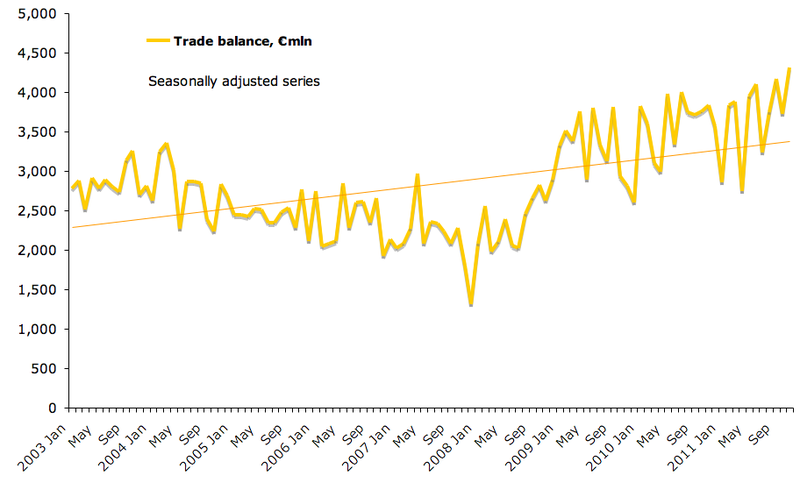 This means the trade balance has reached another historical high at €9.586bn in Q3 2011. The trade surplus was up 9.66% in qoq terms and 5.69% in yoy terms in Q2 2011 and it rose 12.49% qoq and 9.89% yoy in Q3 2011. Of the above €1.95bn improvement in the annual expected trade surplus is likely to come from a €1.66bn improvement (reduction) in the annual trade deficit in services which is expected tos shrink to €11.99bn in 2011. Latest trade stats for Ireland are out - covering preliminary figures for November - and... it's another record trade surplus. I recently wrote about this issue for PressEurop (link here) and for Globe & Mail (link here). 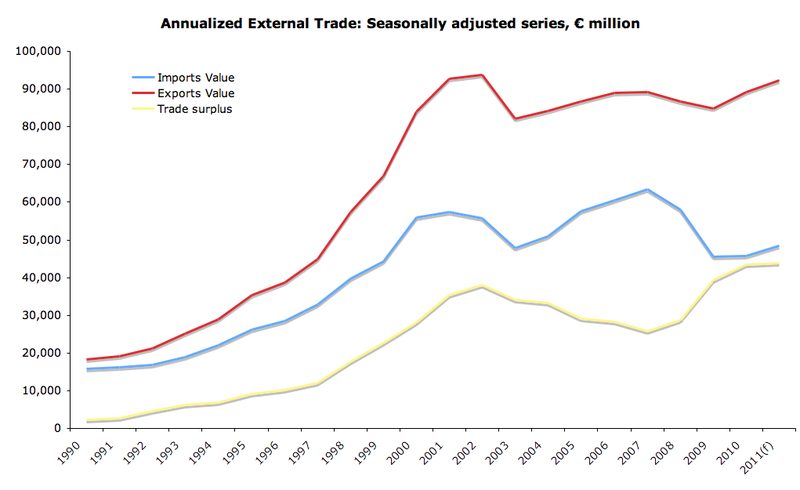 But the latest data from Ireland's external trade side is truly impressive. Until that is, you dig slightly below the surface... where some strange things are starting to pop up. Irish merchandise imports in November stood at €3,706mln, a decline of 5.97% mom that comes on foot of a previous monthly rise of 2.68%. Imports are up 4.91% year on year and relative to 2009 they are up 0.21%. 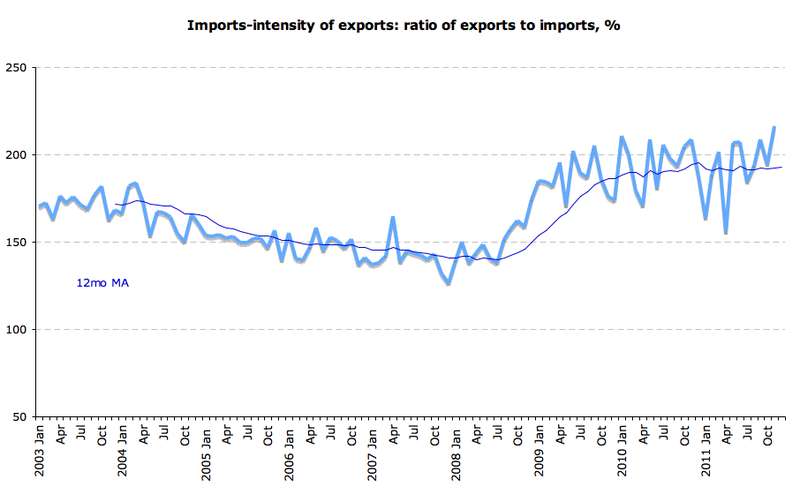 In the 11 months from January 2011, imports are up 6.46% on same period in 2010. Imports increases are, of course, closely linked to increases in exports - as MNCs import much of their inputs into production from abroad. I shall cover this in a second, so keep this in mind. Irish merchandise exports rose in November to €8,016mln - an uplift of 4.58% mom on the foot of the previous month decline of 4.32%. 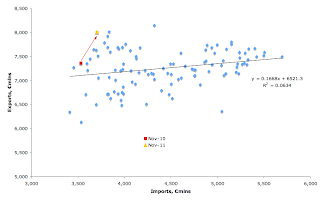 Year on year exports are up 8.83% and relative to November 2009 they are up 23.22%. 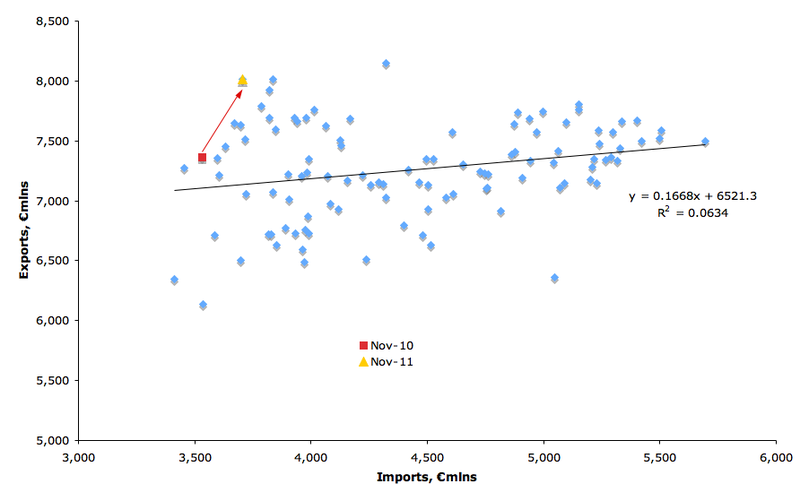 In the 11 months through November, cumulative exports rose 4.09% relative to the same period 2010. As the result, trade balance (again, referencing just merchandise trade) rose 15.74% mom (after contracting 10.75% in October, mom) to an all-time record of €4,310mln. 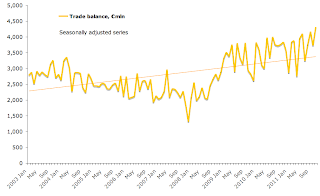 The trade surplus is now 12.44 ahead of November 2010 and 53.5% ahead of same period 2009. 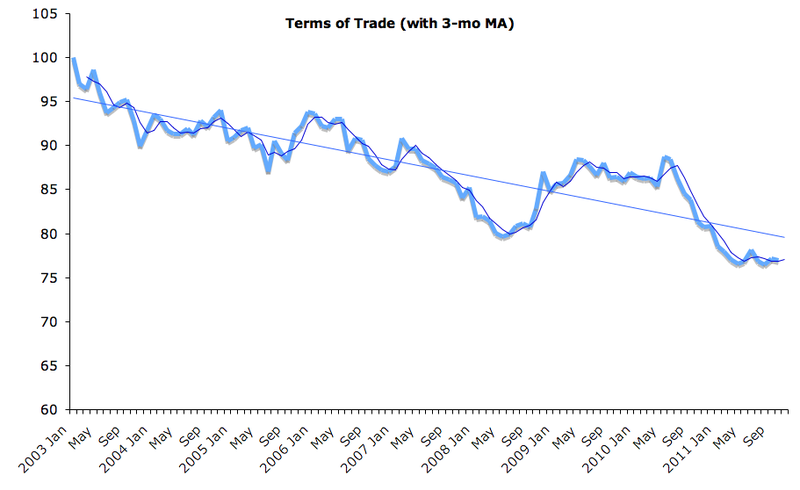 In the first 11 months of 2011 trade balance rose 1.61% on the same period of 2010. The last observation in the previous bullet point is not a strong reason to cheer. 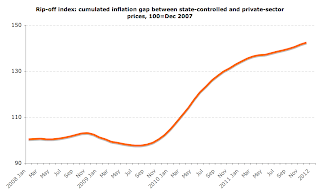 Remember, comparable rise in 2009-2010 period was 8.77% or some 5.5 times faster than in 2011. 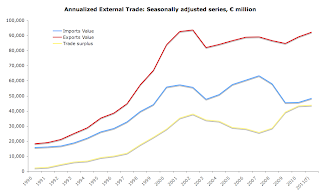 Updating annualized trade stats based on 11 months performance, we can expect imports to come at ca €48.46bn - up 5.82% yoy reversing average annual rate of decline of 9.85% achieved in 2007-2010 period. Exports are likely to post another record year, consistent with my predictions before, at €92.25bn - up 3.36% yoy and well behind the Government-projected rate of over 5%. Trade surplus (for merchandise trade) is likely to reach a record €43.78bn some 0.75% ahead of 2010 result - an increase that would pale in comparison with 10.6% rise in annual surplus in 2010 yoy and well below the average 19.62% increase achieved over 2007-2010 period. So what is going on, folks? 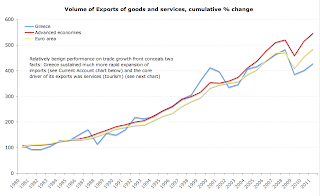 Why are we seeing record surpluses, against fairly impressive exports and growing imports? The answer can be found in two stats. The first one, relates to terms of trade, and the second one relates to transfer pricing. let's take a look, shall, we? 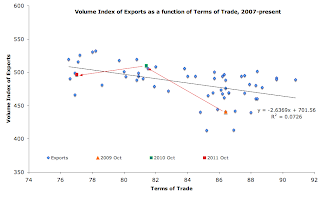 CSO reports terms of trade data with 1 month lag, so we do not have November results yet, but we do have october figures. 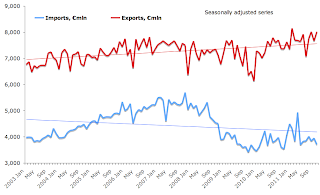 As you can see from the above chart, terms of trade improved (downward movement in series) in october for Irish exporters. And this improvement is rather dramatic both in the short-term and in the long-run. 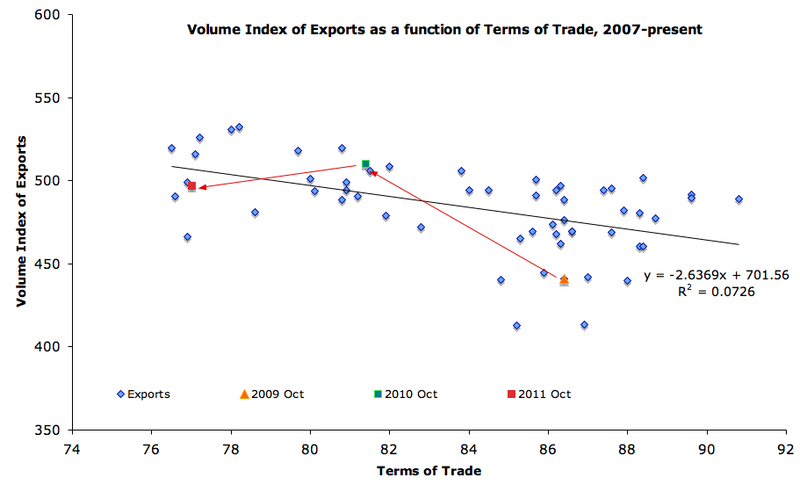 However, as the chart below shows, the improvement in terms of trade in October 2011 relative to October 2010 was not fully utilized by the exporters (we are below the long term relationship, implying that for current levels of terms of trade, our exports should be higher than they are). 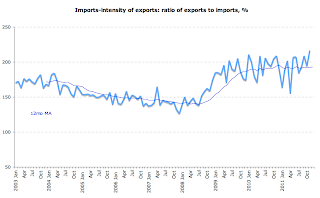 What did, however, take place is a massive jump - to a record high - in overall ratio of exports to imports in merchandise trade (chart below). In more layman's terms, all of a sudden, in November, Irish exporters needed less imported materials to supply more of exports. Hmmm... Has the chemicals component of Viagra pill change? Not really. Has the value of this component become cheaper for Irish operations of the respective MNC? No. 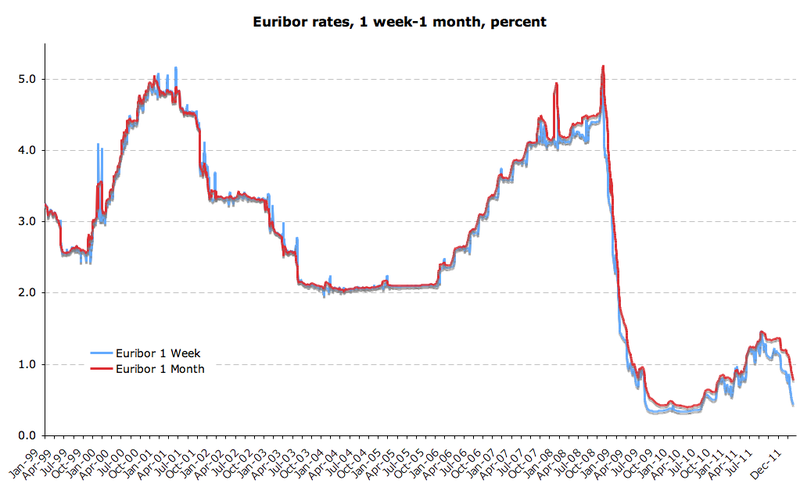 In fact it became more expensive as the euro weakened against other currencies and terms of trade improved. So what did happen? This is not exactly the stuff the dreams of 'exports-led recovery' should be made of, but for now, let us rejoice that at least in one area we have really strong performance in this economy. Afterall, better that than nothing. 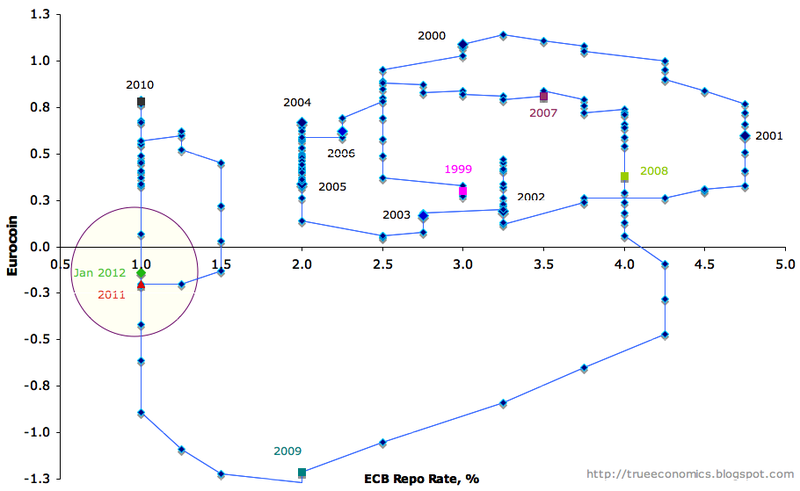 11/01/2012: Risk-off or 'Grab that Straw, Man'? 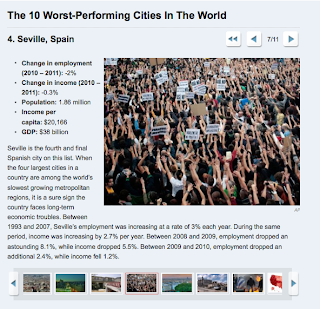 3/1/2012: Are we really still 'filthy rich'?